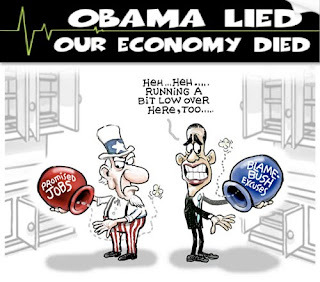 Obama's lengthy term as President continues as his policies steamroll our economy. It's perplexing for me to watch how the stock market ignores big government tax hikes, which are an imminent effect of Obama's health care bill, and yet things in appearance seem to be looking up on Wall Street. Based on the skyrocketing unemployment levels, Main Street is certainly not enjoying the same perception of prosperity as Wall Street. Since day one after Obama became President, the Democrats big government policies viciously attack small businesses, began a long-term process to redistribute the wealth to radicals who want to rule this country, and then voluntells the taxpayers and U.S. companies to pay for a portion of the bill. Another portion of the bill will be quietly but forcibly paid for by everyone with new big government regulations, with the addition of a European-style value-added tax system to help bring the deficits under control. Obama's new bureaucracies of change are a part of an overall plan to control the people, an agenda that comes with entitlements and deficits that will become a permanent burden caused by the Democrats European-style socialized health care takeover. Congress and the Unions are of course exempt from ObamaCare. Socialist regimes reveal their true nature by the special treatment they give to their permanent ruling class; they deny such treatment for ordinary schleps like you and me. ObamaCare means a two-tier health care system. The book titled Animal Farm, a story about Socialism, reminds me about the process of change America is witnessing with ObamaCare, as Democrats are making the fundamental transformation of America a corrupt reality. What's most troubling is the skyrocketing increase in unemployment we've seen since Obama became President of the United States. Even worse is how Obama reacts to higher unemployment. Democrats tell us "Get used to the new normal: 10% unemployment." Democrats believe it is their duty to manage America's decline and see to it that it happens, because they think we deserve to be a nation in decline. The most confusing part about all of this, to me, is the reaction of the stock market. But I may have figured out what is causing Wall Street to rise as the majority Democrats dictate one new policy after another. It may explain why we've seen an odd rise in the stock market during Obama's presidency, even when he was accompanied by a Liberal Super-majority. One way to understand why the market is suggesting, confusingly, that our economy is getting better involves looking at the history of government intervention in the United States. America's recent history of government intervention includes some short term 'bubble' effects in the stock market. Take for instance the Housing Bubble, which burst in 2007-08, and was caused by big government regulations that--at first--gave many reasons for Wall Street to rejoice. Wall Street's initial gains before the Subprime Mortgage crisis was of course due to short term benefits after banks were forced to take on new loans, which appeared to Wall Street like future revenue, but what was in reality considered 'bad debt' by today's standards. It was bad debt back then, too. Because we all want to make money, if Obama's big government is going to force regulations onto our economy's back, of which may create a short term bubble in the health care and insurance industry, I suppose it makes sense to invest while the investing is hot. In fact, Cramer discussed on Mad Money why pessimism about America's long term outlook could be costing investors money in the short term. Wall Street is anticipating 30 million new customers will join the insurance industry once big government regulations begin to force, for the first time in America's history, consumers to purchase a product simply for being an American citizen. Of course the insurance companies should expect a short term gain from what looks like, in appearance, an onslaught of new customers. But is there a hidden dark side to Obama's health care bubble in the stock market? One giant reason to believe any rise in the health care or insurance industry is a bubble in the stock market, and more likely just hot air, is because we all know a tidal wave of regulations, taxes, fees, bureaucracies, waiting lines, bankruptcies and seniors denied medical care are on the way. But it will take time for the negative effects of ObamaCare to start unraveling, because it won't become a full blown tax machine to stall the economy until 2014. The beginning of the Democrats mandated decline of America is but a small light at the end of a tunnel, inching closer each day as the stock market ignores big government tax hikes that will imminently arrive. The closer socialized health care gets to becoming an enforced law, the more we will pay in anticipation of Obama's fundamental change of America. Until then, naysayers of Obama's health care reform will be demonized and attacked by the Democrats gone wild, and perhaps a stock market bubble will be on the rise.